British film doesn’t have a tradition of complete genre mash up à la Quentin Tarantino and Robert Rodriguez, the two visionary directors who have pumped some pulp and horror into the American gangster film. Writer-director Ben Wheatley's (DOWN TERRACE) style is subtler, a bit more creepy, but no less genre defying. In his new feature KILL LIST, he starts with a working class family drama that takes unexpected turns, evolving into a brutal hit-man saga, before finally plunging into the darkest territories of human interactions. It is deeply unsettling to watch, mainly due to the tension it creates between the normality of suburban life and scenes of surreal violence. A couple raises a 7 year old son, the father takes him on a casual stroll along the river, before he sets off to a series of kills, which is his job, but not only that. They are not handled professionally, but with utter, abhorrence for the victims, a style to kill that results from a dark past, which is left blank, unexplained, just exists as a haunting shadow. Reality is cut up, quite literally in an edit (Robin Hill) that occasionally runs the sound on a different time frame than the image, weirdly showing a character talking when he is actually displayed in silence on the screen. There are also gaps in the story line, certain things just don’t make sense, and the end is as chilling as it is ambiguous and hard to understand. But that does not take away the subliminal power that this film exerts, relying on close-up documentary style filming (DP Laurie Rose), and improvised dialogue. A welcome sign that filmmaking has not come to an end of commercialized standards that make us fall asleep every time we take a tenner out of our pockets in order to enter a movie theatre. 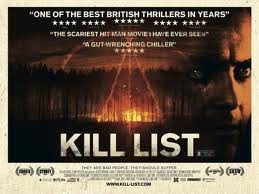 KILL LIST played Frightfest 2011 and is currently on release in the UK and Ireland. It will be shown at the Strasbourg European Fantasy Festival on September 17th.